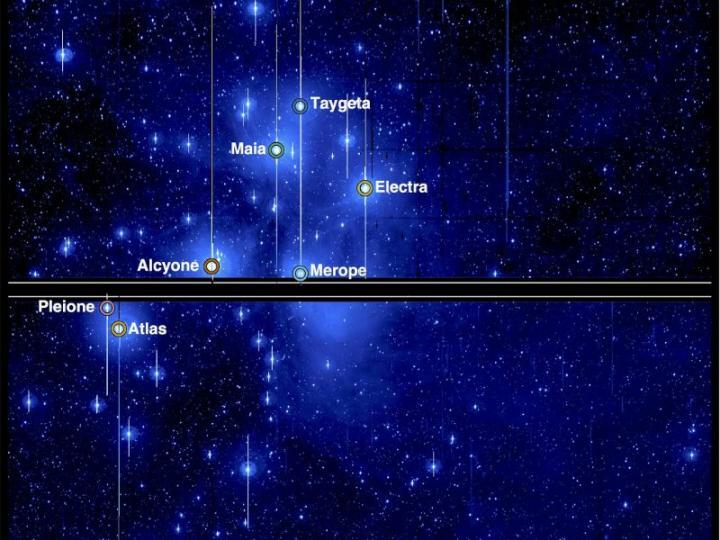 ATLANTA–An international team of astronomers has used a new algorithm to enhance observations from the NASA Kepler Space Telescope in its K2 Mission and perform the most detailed study yet of the variability of the Seven Sisters star cluster. The Seven Sisters, known to the ancient Greeks and to modern astronomers as the Pleiades cluster, are a set of stars which are visible to the naked eye and have been studied for thousands of years by cultures all over the world. Stars such as the Seven Sisters are ordinarily far too bright to look at with high-performance telescopes, so researchers from the Stellar Astrophysics Centre at Aarhus University in Demark and Georgia State University have demonstrated a powerful, new technique for observing such stars. The work is published in the journal Monthly Notices of the Royal Astronomical Society. Satellites such as Kepler are engineered to search for planets orbiting distant stars by looking for the dip in brightness as the planets pass in front. These satellites can also be used to study asteroseismology, the structure and evolution of stars as revealed by changes in their brightness. Because the Kepler Mission was designed to look at thousands of faint stars at a time, some of the brightest stars are actually too bright to observe. Aiming a beam of light from a bright star at a point on a camera detector will cause the central pixels of the star's image to be saturated, which leads to a very significant loss of precision in the measurement of the total brightness of the star. This is the same process which causes a loss of dynamic range on ordinary digital cameras, which cannot see faint and bright detail in the same exposure. "The solution to observing bright stars with Kepler turned out to be rather simple," said lead author Dr. Tim White of the Stellar Astrophysics Centre at Aarhus University. "We're chiefly concerned about relative, rather than absolute, changes in brightness. We can just measure these changes from nearby unsaturated pixels and ignore the saturated areas altogether." However, changes in the satellite's motion and slight imperfections in the detector can still hide the signal of stellar variability. To overcome this, the authors developed a new technique to weight the contribution of each pixel in order to find the right balance where instrumental effects are cancelled out, revealing the true stellar variability. This new method has been named halo photometry, a simple and fast algorithm the authors have released as free open-source software. Most of the seven stars are revealed to be slowly pulsating B-type stars, a class of variable star in which the star's brightness changes with day-long periods. The frequencies of these pulsations are the key to exploring some of the poorly understood processes in the core of these stars. The seventh star, Maia, is different: it varies with a regular period of 10 days. Previous studies have shown that Maia belongs to a class of stars with abnormal surface concentrations of some chemical elements such as manganese. One explanation for the cyclic light variations is that dark and light patches associated with these chemical elements cross the face of the star as it rotates. In order to confirm this idea, White and his Georgia State collaborators used the Georgia State University Center for High Angular Resolution Astronomy (CHARA) Array to determine the actual size of the star. The CHARA Array at Mount Wilson Observatory in California is the largest optical interferometer in the world, and it is ideal for close-up views of the stars. The CHARA Array observations of Maia confirmed the star has just the right size to explain the light variation as the result of a mottled rotating star. No signs of exoplanetary transits were detected in this study, but the authors show their new algorithm can attain the precision that will be needed for Kepler and future space telescopes such as the NASA Transiting Exoplanet Survey Satellite to detect planets transiting stars as bright as our neighboring star Alpha Centauri. These nearby bright stars are the best targets for future space missions such as the NASA James Webb Space Telescope. To read the paper, visit https://academic.oup.com/mnras/article/471/3/2882/4081952/Beyond-the-Kepler-K2-bright-limit-variability-in?searchresult=1.